We are an independent Montessori school in Charlottesville, Virginia. We enroll children who are three years old, on or before September 30 of the year they enter, and continue through age six, the kindergarten year. 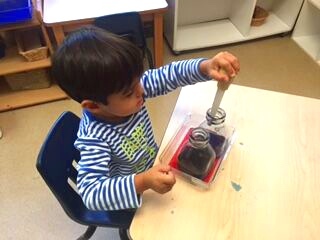 University Montessori School, a member of the American Montessori Society, is a diverse family-centered school community embodying the best practices of Montessori education in facilitating the academic, emotional, physical and social development of each child. In an atmosphere of respect and warmth, parents, teachers and children collaborate to nurture an enduring love of learning and a view of the responsibilities and possibilities of life. 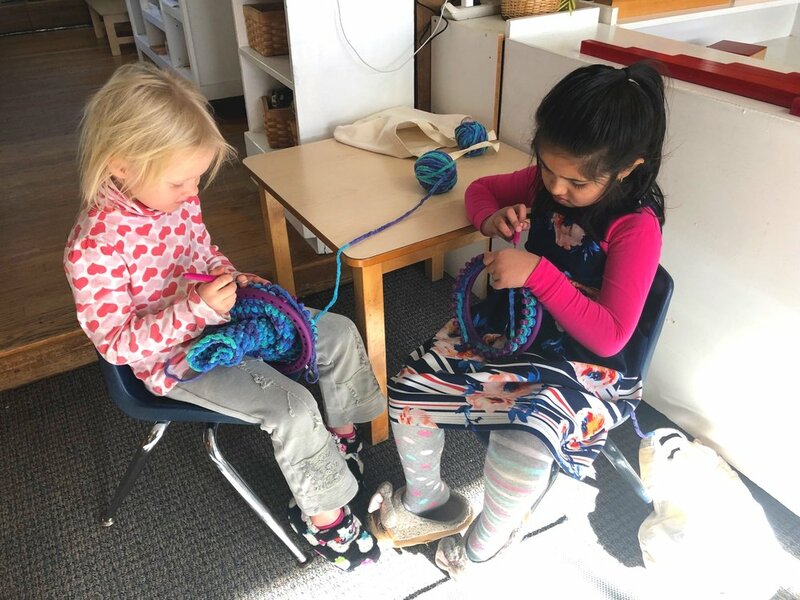 We are a welcoming community in which children and adults find friendship and support, a place where all are encouraged to broaden their understandings of themselves, others and the world. Our classroom practices include mixed-age groups, a focus on global education, valuing teacher observations and careful design of the environment and materials. Empowering all participants as teachers and learners, children are initiating, doing, talking, and sharing in a space that is theirs, with the guidance of their teachers. Mixed-age groupings enable children to learn from one another, gain autonomy and develop self-esteem. Having a diverse ethnic mix prepares children to accept, respect and understand themselves and others in our diverse society. Our cozy, home-like setting promotes learning in a warm, comfortable space, helping children feel at ease while encouraging independence as they move through their day. Classroom activities are carefully designed to focus on the development of specific skills and concepts. We expose the children to a wide range of intellectual, social and physical activities, and give them long blocks of uninterrupted time. They learn to ask questions and to seek explanations, to focus their attention on an interest, to work independently or with classmates, to solve problems and to discover the joy of learning. In this way the children take responsibility for their own learning. The curriculum is rich in opportunities. The Practical Life materials enable children to learn how to care for themselves and their environment. The Sensorial materials develop children’s perceptual and sensory abilities and refine their observation skills. Language materials and activities encompass speaking, listening, reading and writing. The Math curriculum is concrete and develops a solid concept of numeracy. Other curricula areas are science, music, cultural geography, and physical education. Throughout the year materials are revised and expanded in response to the children’s changing needs and interests. "When children come into contact with nature, they reveal their strength." UMS is lucky to have Jamie and her garden to provide enrichment opportunities for 3 children from each classroom during the morning work cycle. The students participate in a vast array of enrichment activities: gardening, cooking, weaving, art, and more. Most of this program rotates around the garden, and sees the children participating in the upkeep of our garden beds throughout the year. As the children are given the opportunity to care for the garden, art lessons may be available – sketching the fruit that is ripe and ready to be picked, or a child may choose to work on a small loom, creating a pot holder while sitting by the garden. The aim is to allow children to choose their own enrichment activities, much as they choose their own work in their classrooms. Our sustainable Wildlife Habitat was created, with the help of the Center for Urban Habitats and members of our UMS community. This special area is home to a variety of wildlife, and is integrated into our classroom curriculum throughout the year. Children have opportunities to explore, participate in preparing the soil, planting, and observe wildlife. We use the space year-round, so children are able to connect directly with the seasons and the changes in their natural world. First and Second Year Children who stay past noon continue the day beginning with lunch at noon. After lunch, children who take a nap transition downstairs. All children in the nap room spend a minimum of thirty minutes on their cots as per state regulations. At 2:30, the lights come on so the teachers and children who are awake can prepare the environment and snack. Children are also invited to join their friends on the playground or the quiet activity room if the weather is not conducive to outdoor activities. Snack is available at 3:15. Children are involved as much as possible in the preparation and serving of snack and during the growing season we include food from our own small gardens. In the afternoon the playground and the downstairs classroom are open and the Montessori materials are available. Our goal is to provide a program which meets the needs of the children and continues the Montessori Method throughout the child’s day. Grace and Courtesy lessons continue in the afternoon, as well as the teacher’s role of preparing the environment, guiding the children’s self-directed activities, and facilitating problem solving. This year, the afternoon is also emphasizing language learning, providing Spanish lessons 2-3 times a week through songs, games, and art. Afternoon Montessori finishes at 5:00, when the children help the teachers to clean the classroom and prepare for the end of the day. All children at UMS are picked up by 5:25. Occasional after care is available for $12/hour on a prearranged or emergency basis at the discretion of the Director.